Ahead of State Of Origin 1, and in front of an audience of 80,000 live spectators, more than 2.5 million TV viewers and many millions more online, the legendary Cold Chiselannounced their One Night Stand tour of Australia. It will be a tour unlike any the band has previously undertaken and will include a number of unique performances and ‘firsts’ for an Australian band. The band revealed tonight that they will ‘kick-off’ the tour with a special mini-concert at the NRL Grand Final at ANZ Stadium on Sunday, 4 October, where they will be the only artist performing. That same weekend they will play a full headline set at the 2015 Deni Ute Muster on Friday, 2 October. From there, Cold Chisel will traverse the nation (full details below), headlining festivals like The V8 Supercars Castrol Gold Coast 600 and the Decades Festival in Strathpine, Qld, playing arenas and a number of special performances – including being the first Australian band to headline the mythical Hanging Rock in Victoria and also Hope Estate in the New South Wales Hunter Valley. There are also big shows in new venues for the band, like 1300SMILES Stadium, Townsville (Saturday, 7 November) and Perth Arena (Saturday, 14 November) which wasn’t completed when the band last played Perth in 2012. Cold Chisel is excited to confirm that The Living End will be joining them at the Decades Festival, Hope Estate and Hanging Rock. Frontman Jimmy Barnes revealed tonight that the band felt compelled to undertake the tour as a direct response of the incredible reaction they received when they recently announced two special shows under the banner of ‘The Last Stand of Sydney’s entertainment centre’ to mark the closing of the Qantas Credit Union Arena (formerly known as the Entertainment Centre). Promising a show that referenced their classic 1983 Last Stand tour, which finished at the iconic venue, these two new shows captured the fascination of music fans around the country with all 20,000 tickets selling out within minutes – and with interstate fans screaming to be included. “In March we played a homecoming show in Adelaide to 35,000 people,” said Barnes. “Then when we announced these two shows in Sydney the reaction was ballistic. The demand blew our minds, suggesting that it was time for us to get back out there.” The band then hatched the idea of One Night Stand, with each venue being a definite ‘for one night only’ experience – with the exception of Sydney where the tour concludes with the two already sold-out shows at QCUA. Of course Barnes and his band mates Ian Moss (guitar/vocals), Don Walker(piano/keyboards), Phil Small (bass) and drummer Charley Drayton shouldn’t have been surprised by the excitement: With a history that spans forty years and a reputation forged through blistering live shows and a catalogue of much-loved songs and albums, Cold Chisel has become a part of the nation’s psyche. Their story is colourful, volatile and proud and their music continues to be ingrained in the hearts of generations of Australians. They’ve sold almost 7 million albums across bona-fide Australian classics like East, Breakfast at Sweethearts and Circus Animals, while songs like Cheap Wine, Choir Girl, When The War Is Over, Flame Trees, Bow River, Saturday Night and Khe Sanh remain the staple of radio playlists, pubs, jukeboxes, concert halls and karaoke bars across every part of the country. Their reunion in 2009, for a one-off performance at Sydney’s Olympic Stadium, saw the band play in front of 50,000 people – the biggest crowd of their career. This sparked a renewed enthusiasm for working together again – onstage and in the studio. In 2011 they undertook the Light The Nitro tour, one of the biggest tours ever by an Australian band with over 285,000 tickets sold. And in 2012 they released the critically hailed and Gold-selling No Plans album, which debuted at #1 on the ARIA Australian Album chart. After a three year break, 2015 feels like the right time to get back in the saddle. 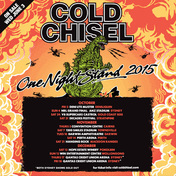 Members of COLD CHISEL’s mailing list will get exclusive first access to the best tickets for all shows on the One Night Stand tour. All members will be able to buy a maximum of 6 tickets from 10.00am until 10.00pm (local times) on Monday, 1 June using a special password which will be emailed to them on the evening of Sunday, 31 May. Further tickets will be offered to members of the My Ticketek and other affiliated databases from 10.00am until 10.00pm on Tuesday, 2 June before a final allocation of seats is offered to the general public at midday on Wednesday, 3 June. All times mentioned are local times. NB: To receive the password for the Cold Chisel Database presale you must be signed up for the band’s mailing list before 6.00pm on Saturday, 30 May. To receive it you must sign up for the email database. Tickets not yet available. Stay tuned.